All pre-orders include an immediate 320k MP3 download of lead single “The Road Reversed,” as premiered by NPR Music. Contingent on manufacturing schedules, we will ship your pre-ordered album approximately a week in advance of the October 5, 2018 worldwide release date. If you place an order that includes both pre-ordered item as well as immediately available items, the entire order will ship once all the pre-ordered item become available. If you’d like the immediately available items to ship earlier and separately, please contact us at david@paradiseofbachelors.com to arrange additional shipping and handling charges for a split order. For digital-only preorders, please visit Bandcamp (which also offers uncompressed, high-resolution audio files) or your favorite digital marketplace. Nathan’s first two PoB albums—Nansemond and Whole & Cloven—are now both on sale for 20% off when you use coupon code MISTAKEN during checkout on our website through October 5. 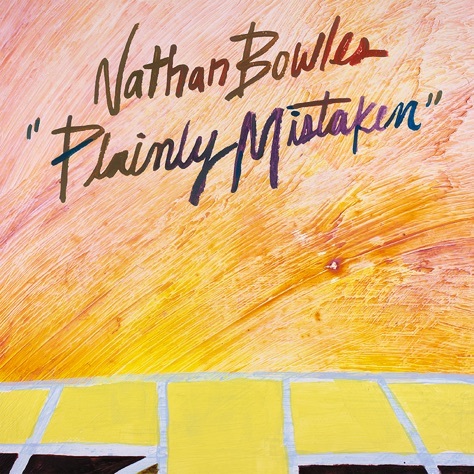 Plainly Mistaken, the playfully subversive fourth solo album by Durham, North Carolina multi-instrumentalist Nathan Bowles, begins with a lullaby written by a child for an adult. The seven year-old Jessica Constablecomposed “Now If You Remember”—the titular lyric continues, precociously, “we were talking about God and you”—for English singer Julie Tippetts’s 1976 album Sunset Glow. Bowles’s ethereal rendering represents a rather radical departure from his previous recordings; his placidly plaintive singing has been stripped of its otherwise genial, ursine gruffness, and the brief song floats by on the sedative ebb tide of banjo and pianos both acoustic and electric. Plainly Mistaken, its title apt, adjusts assumptions we might have made about the scope and scale of Nathan’s music, which sounds both more exquisitely controlled and more dangerously unleashed than ever before. We hear here his ever restless roving between the poles of Appalachian and Piedmont string band traditions and ecstatic drone. In the former category are his percolating full-band rerecording of Ernie Carpenter’s “Elk River Blues” (which previously appeared in a very different solo iteration on A Bottle, A Buckeye ); “Fresh & Fairly So,” the indelibly careening melody of which could be an old-time standard; and “Stump Sprout,” the ghost of a misremembered reel. The latter category includes the solo recordings “Umbra,” “Girih Tiles” (played on the “mellowtone,” a custom banjo/bazouki hybrid instrument built by Rex McMurry’s father Maurice), and the improvised “In Kind” suite. However, never before has Bowles offered such a surprising, but succinct, crystallization of his diverse work with other groups—Steve Gunn, Pelt, the Black Twig Pickers, and most recently, Jake Xerxes Fussell’s band, in which he serves double duty on drums and banjo—made possible here by the fleshed-out full-band configuration and arrangements. Colleague and mutual musical admirer Bill Callahanwrites of these scale shifts in Nathan’s music as, alternately, “the grand blankness of seeing everything at once” or “a pinhole vision that soothes and subjects in its narrowness”—the two conditions as, perhaps, two sides of the same equation of Panopticon-to-pinhole compositional logic. That also sounds like a description of spiritual jazz, or the trance context of gnawa song, both of which inform Bowles’s work here. •Deluxe 140g virgin vinyl LP features heavy-duty board jacket, color LP labels, and high-res Bandcamp download code. •CD edition features gatefold jacket with LP replica artwork. •RIYL: Steve Gunn, Jake Xerxes Fussell, the Black Twig Pickers, Pelt, Jack Rose, Michael Chapman, Bill Callahan, Josh Abrams and Natural Information Society, Daniel Bachman, Marisa Anderson, William Tyler, Hiss Golden Messenger, Mary Lattimore, CAVE, Henry Flynt, Clive Palmer, Terry Riley, Julie Tippetts.